A wall of water facing a cliff and in the middle, a man. Garrett McNamara looks ridiculously small lost in the trough of the wave. It is November 2011 and Nazaré is then a traditional fishing village located 130 km north of Lisbon. There is a steeple, a city center with steep streets, a long sandy beach that breathes calm and serenity and peanut sellers in traditional dress… But everything is about to change. Before this 45-year-old American, no one had surfed such a high wave. “24 meters,” they said then. “It’s a 10-storey building,” reports said. Very inspired, the mayor at the time rushed on the occasion and announced a new world record even before it was approved. He knew it, and seized the opportunity to project his small town of 15,000 inhabitants on the front of the global stage. The images were impressive, circling around the Web, newspapers and TVs. They have been viewed millions of times. 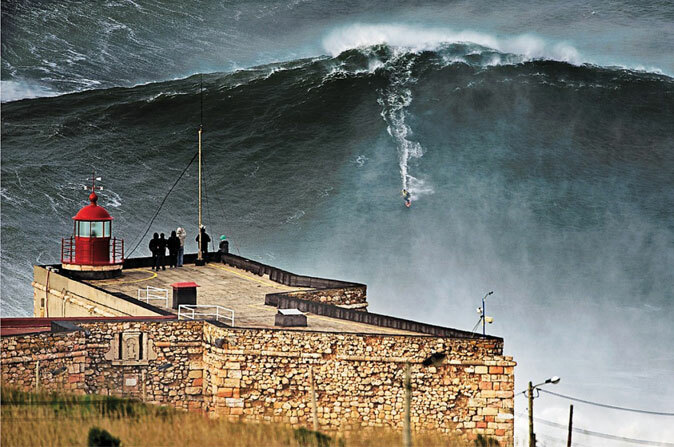 Nazaré became the new stronghold of global surfing. Then the best surfers arrived from everywhere to ride this monster. And they were not alone. EDP, Mercedes, Red Bull became noticeable on their chests, the most prestigious sponsors jostling to make a place for themselves. Everyone knows that this is a worthwhile investment. The giant waves of Nazaré, due to an underwater canyon, are a unique phenomenon and attract more and more people. For each surf event, the city swells with curiosity and this small town becomes, for a weekend, the center of the surfing world. In 2014, just after a new record set by McNamara, Nazaré was even ahead of Lisbon in Google searches. A feat for this city that no one knew until recently. The economic benefits are substantial. Over the years, Nazaré has become a city with a flourishing economy. The dozens of hotels and restaurants are always busy and their occupancy rates are high ten months a year, compared to three months before the Garrett McNamara act. The lighthouse, an ideal spot to attend the surfing events, has increased from 80,000 visitors in 2015 to 174,000 in 2017. Similarly, the funicular attendance numbers approached 1 million in 2017. It is no coincidence that Portugal spent $240,000 last June to display the giant waves of life-size Nazaré on Time Square. The goal was clear. Position Portugal as the surf destination par excellence. And it works. Portugal is now the third destination associated with the word surf on Google just behind Hawaii and Bali. Similarly, the World Surf League has announced the transfer of its headquarters in Europe, in France for 30 years, to Lisbon in 2019. If Nazaré saw its economy explode with surf, it is the whole of Portugal that is today still riding the wave.